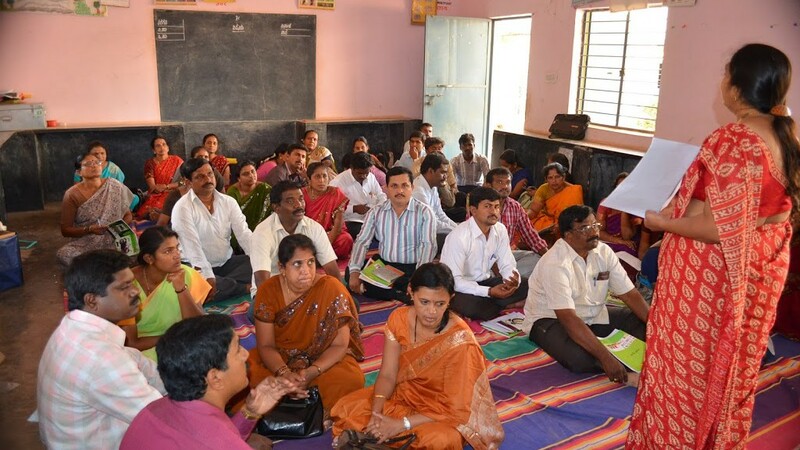 Nalini NK & Suman Nadakarni of the Resource team visited GLPS Ilathore, in Sadahalli Cluster of Devanahalli Taluk. This is an account of their experience at the school. 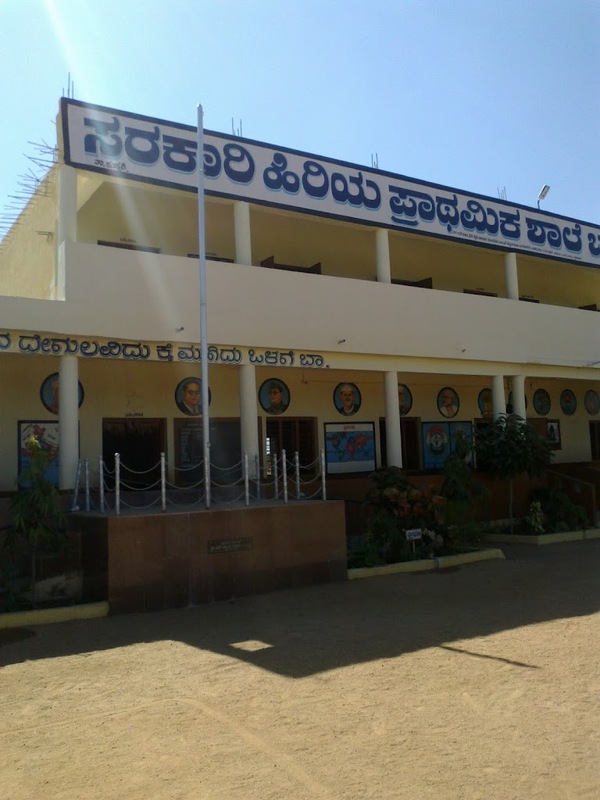 This school is situated in the interior and is around 3kms from the Devanahalli Main Road. The transportation facility to the school is somewhat limited, as the buses travel once in 2 hours and therefore people here either walk, or take 2-wheelers. We reached the school at around 10.30 am. As soon as we entered the school campus, we were surprised to see the environment inside the school. The school compound is well built. There are trees planted on both the rows of the ground periphery, which houses a beautiful small garden in between. 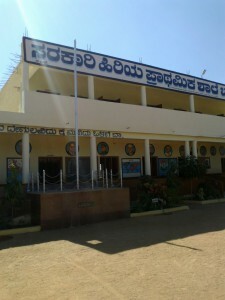 The school premises are kept very clean and tidy. 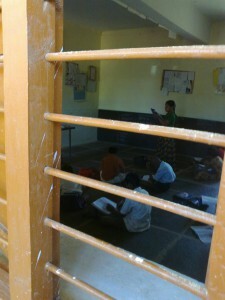 The floor of the classrooms are made up of tiles and look very attractive and shiny. The school has separate toilets for boys, girls and staff members. When enquired about the environment here, the Head Master Mr. Shivakumar said that it is a result of the great support and farsighted vision of the SDMC President, members and parents. Also, each classroom is decorated with TLM materials in a very neat and orderly fashion. We then visited the Nali-Kali Class. What we observed there stunned us with excitement. 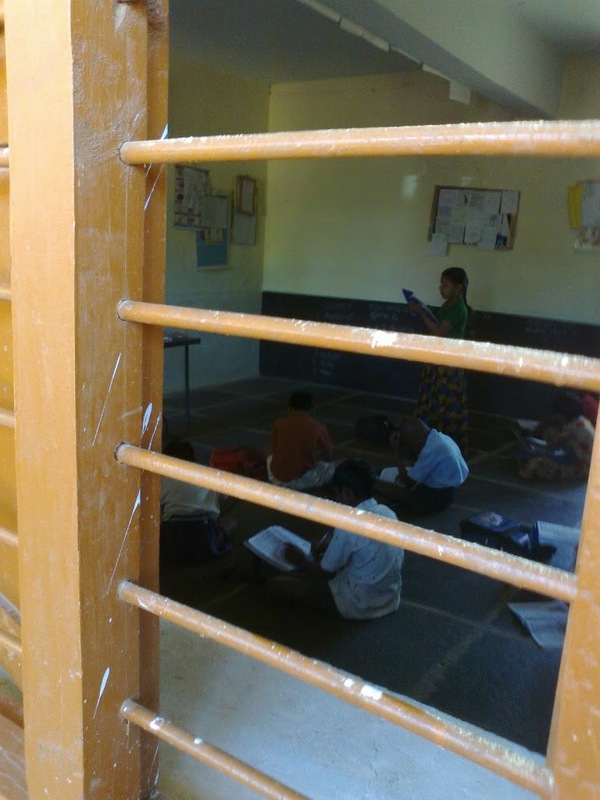 The walls of the classroom are divided into small rectangular spaces, which act as a black-board for every child. The Children write on the board, erase and re-use the space and hence making learning not just effective but also a lot of fun. The same pattern is followed in all 3 Nali-Kali classes. 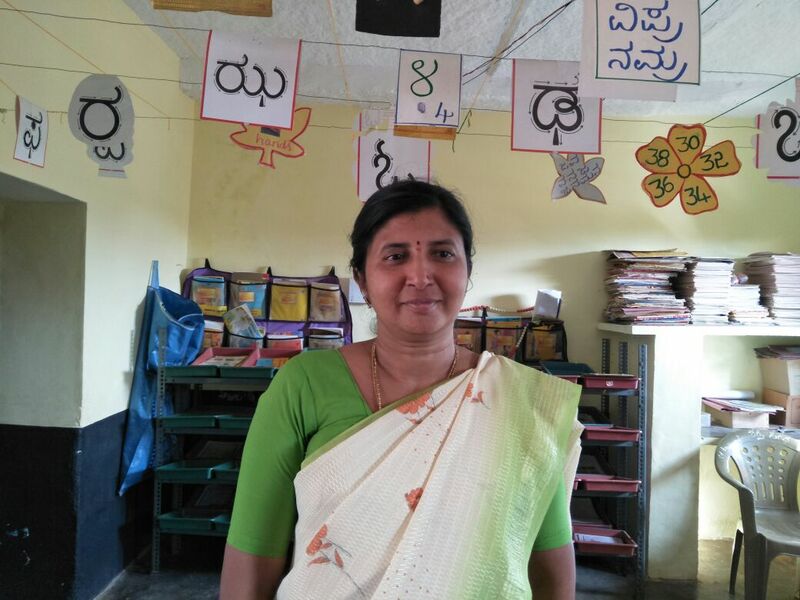 The teacher Rajeshwari is a calm and a very enthusiastic lady, and hence is able to pay individual attention to every child. As we were passing by we saw that class 5 was self-handled by the kids. The children seemed quiet. The class leader was reading a lesson aloud and the rest of the children were following her enthusiastically. The Head Master, then said, that every class in this school followed a similar pattern. Outside the classrooms, in the verandah, the school has a small Library which houses story books, newspapers and magazines. The children whenever free visit the library corner and spend time in reading. On the other side of the verandah, there is a cupboard with shelves, where the glasses and plates are kept. After, the children finish their lunch; the utensils are washed and kept in the shelf, vertically allowing the water to dry up. Also, there are sufficient number of plates and glasses for every child in the school. The Children are enthusiastic and very eager to learn. The teachers also are very supportive of the children. Identity cards are given to each and every child. Both, English and Maths programme are running well in this school. 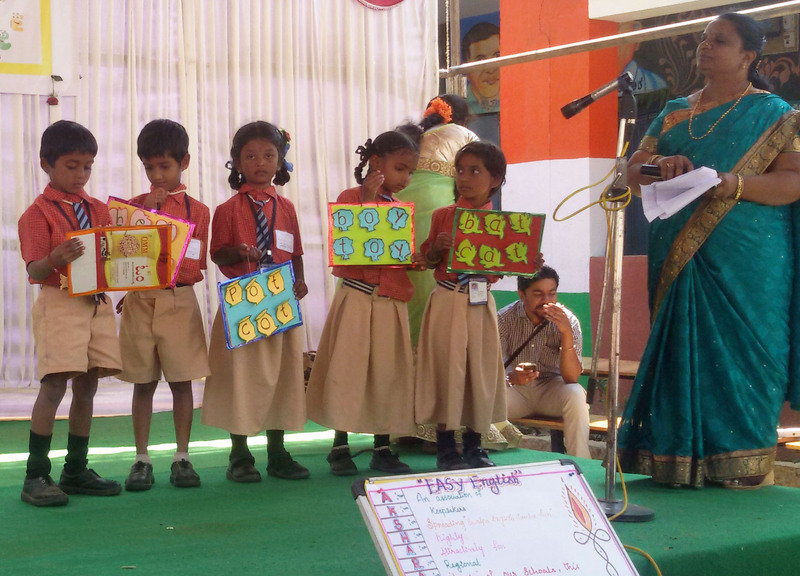 The children are grouped, and then encouraged to use the Teaching Learning Material (TLM) in groups, hence allowing group study and also imbibing traits of teamwork and leadership. Math is been taught in the school using Akshara’s TLM, teachers and children both thoroughly enjoy teaching and learning math this way. 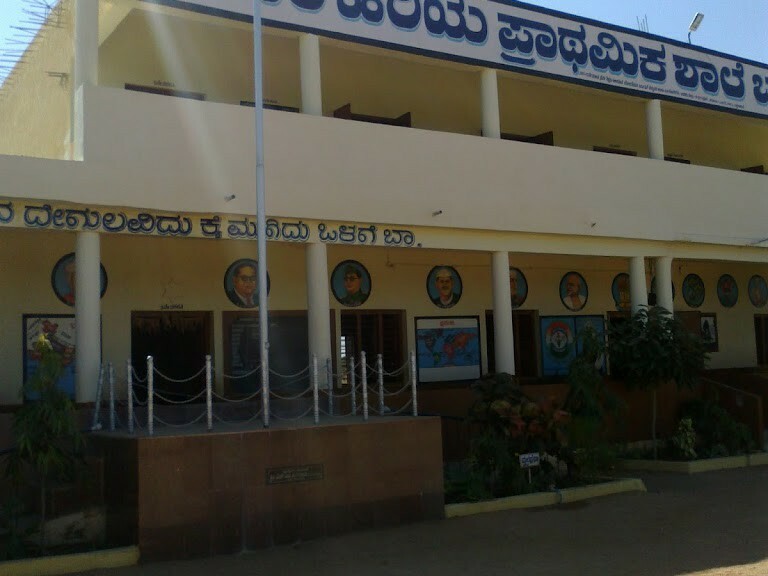 Government schools in Karnataka will have to compulsorily teach English as one of the languages from Class 1. However, only some government schools seem to be complying with the rule. The decision has been taken to prevent students from moving to private schools, he said, adding that there will be no examination for English from classes 1 to 5. Speaking at the inauguration of the Vidyavahini project under Sarva Shiksha Abhiyan, the minister said that there will soon be around 6,000 schools with community-based interventions like the school-adoption programme. Medha Bhattacharya, a student of Indus International School studying in Class 12 volunteered at the GKMPS Munichinappa Adugodi School. This is what she had to say about her experience! I remember the first day I went to the school for (volunteering) very clearly because I had been incredibly sick the night before and just about staggered into the Headmistress’s office. Unfortunately I was entirely unable to understand anything that was being said because my knowledge of Kannada is rudimentary at best and non-existent at worst. But by the end of the meeting it was determined that I was to teach English to children from the fourth to the seventh grade for one period everyday. Needless to say I was quite freaked out. I had never actually taught anyone anything before unless you count helping people remember dates for a history exam. I was also well aware of what kids think of new teachers, especially flaky substitute ones. My first class was with the seventh graders. I had made a couple of worksheets that I thought they could do. The response I got was incredible. All the kids were intensely competitive, trying to do everything as efficiently and intelligently as possible. Almost all of them got everything right and I knew I had to make stuff a little more challenging. That class was definitely one of the brightest. They were all really helpful and honestly made everything so much less scary. I think the class that I probably spent the most time with though was the fourth grade. They were the polar opposite of the much better behaved seventh grade. There were only about twenty of them but honestly it felt like there were at least fifty. The first thing I did with them was to give them worksheets with the alphabet and an object beginning with that alphabet written next to it. They traced over the words quite peacefully albeit slightly noisily. And then to make it a little more interesting I put up an alphabet chart with pictures of objects from A to Z. But I left out the words underneath it giving them pieces of paper with the word on the pieces and told them to stick it onto the chart. And that was when all hell broke loose. Everybody wanted to stick his or her word up at the same time. I think a couple of kids started crying, whether in sheer frustration or because they actually got injured in the mad rush towards the chart I will never know. But after a while we managed to get all the words stuck up there and everyone was really really happy. Yet again their drive and sheer joy in learning and doing something a little different completely surprised me. I think out of all the grades fourth standard were probably the most affectionate, hugging me every time I came and generally being absolutely lovely. The class I particularly remember when I taught the sixth grade was the one with the (animal) flashcards. I divided them into three teams and the team that could recognize the most number of animals won. There was one boy literally knew the names of almost all the animals on the flashcards. I did the same thing with the fifth grade and when I told them to divide into two teams the boys rushed to one side and the girls to another. The girls absolutely decimated the boys and were incredibly proud of their victory. Another particularly memorable class was when I took a chart with the lyrics of a song on it but with some words missing. I gave the kids (seventh graders) the missing words, played the song and they filled it up. Then I played Hello and Goodbye by the Beatles to teach them opposites. The most fulfilling part about this whole experience though was probably the way they talked to me and asked me how I was. Despite the fact that I don’t really understand Kannada they would talk to me before I left and ask me when I was coming next. I had a really good experience and I would definitely do it again if I could. Geeta Kumar,visited Akshara Foundation a couple of weeks ago. She was a school teacher in Delhi and also a member of the Committee which wrote the Position Paper for teaching of English, under the NCF 2005. This is what she had to say about us. A chance conversation with a Satsang Foundation devotee brought me in touch with this organisation. Scrolling through their website, I felt quite interested , especially because I had wanted to make some difference in the government school education sector but was clueless about how to make it happen.The response from the Managing Trustee was most welcoming and warm, to say the least. A visit to the Foundation’s office and interaction with her was gave me a good idea of the nature and scope of the work that they are doing, and I was truly impressed and thrilled. For the first time (and I really mean this), I saw evidence of something being done to address the real needs of the student and the teacher in learning and teaching English. It is most exciting to see that a model is being developed which can make a difference. I was also given an opportunity to visit some schools in Hoskote where the programme is being used presently. There I saw that the commitment of the Foundation members was receiving a very positive response from the teachers and the children. The personal inter action of the programme executors with their target teachers and students seemed to me a wonderful way of making learning actually happen at the primary school level. If only our state and national bodies in charge of primary education would care to notice this model and learn a few lessons from them, things will begin to brighten in the dismal scene of primary education in the country. My congratulations to the team for the great work that they are doing and my prayers that they will reach out to other parts of the state and the country so that the aspiration of millions of students for gaining competence in the use of English will become a reality. For people who volunteer for a cause it is the ultimate sublimation. 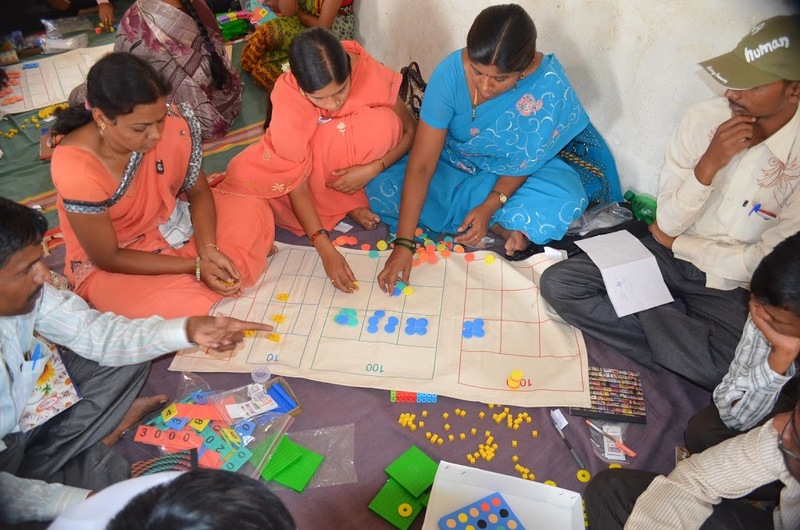 Volunteering is activity on a higher plane, an attempt at an idealized world – the involuntary instinct for the level playing field, breaking down barriers of inequity and deprivation, giving everybody a fair chance, the belief in bringing about systemic change in a system that under-performs, simply drags its feet or outright fails. It is an act of betterment and uplift. Those who have giving to those who do not. Akshara regularly facilitates volunteering in education in Bangalore – at government schools, anganwadis and community libraries, or prepares the ground for homework support classes, English teaching sessions, a sports event. Akshara galvanizes the corporate sector, parents, the student community and citizens and is looking to expand the volunteering base exponentially. But looking at the broader scene in the city, is volunteering a case of isolated largesse? Will it remain the occasional wholeheartedness, the odd abundance, not a continuous stream of the spirit? Says Ashok Kamath, Chairman, Akshara Foundation, “For many years Akshara talked about doing learning programmes for children, about building a relationship with government schools. That alone is not enough. If we can get people who have had the privilege of education – teachers, parents, citizens – aligned to a common goal of equitable access to quality education, we can make an impact. What can be done to enlarge the volume of contribution and make volunteering a self-sustaining movement of substantive results? 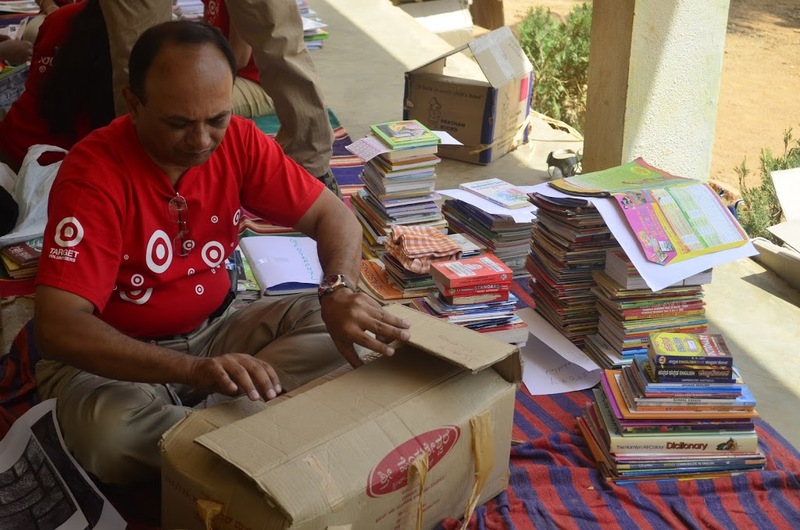 This is what two of the Target India employees who volunteered recently at the Government Kannada Higher Primary School (GKHPS) in Doddaholluru, Hoskote Block, giving freely of their time, energy and resources, had to say. Keshav: “We do something like this once in a while and sometimes forget about it. A more consistent approach is called for. A more dedicated approach – the same pool of volunteers in the same school repeatedly so that children and volunteers can come together. So that children can look on us as somebody they can count on. We’re setting all this up in this school – a library, a science room. But we don’t know how these resources will be used by the school and its students. We must come back. We want to come back. The crux, however, she says, is to connect citizens to schools. 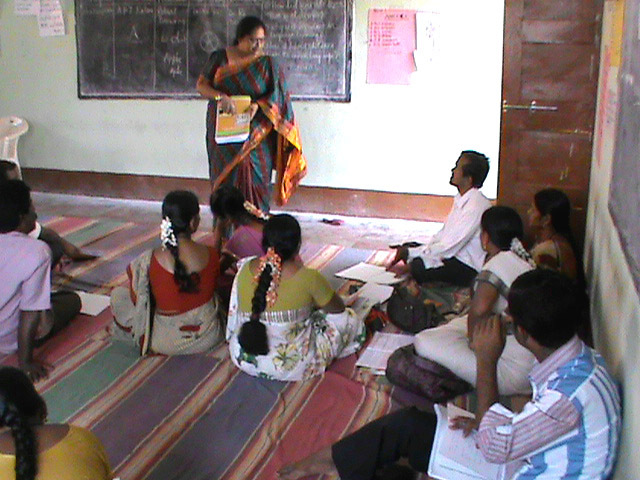 Akshara is positioning itself to do that through the Karnataka Learning Partnership (KLP) framework. 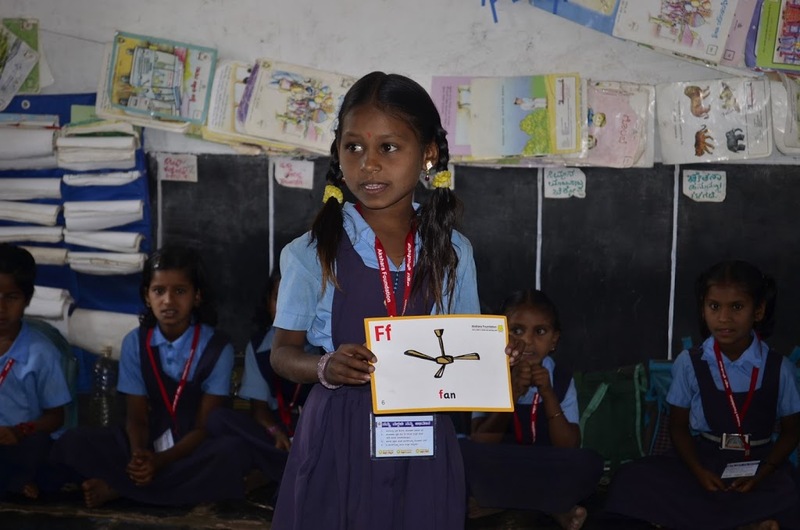 What Akshara has learnt from experience is that schools are wary of arbitrary goodwill. They have specific deficits they would like enriched – a drop in Mathematics, language failure, or, as in the GKHPS, Doddaholluru, a library in decline or a thriving science laboratory with no place to call its own. It is the 17thof September. A remarkable instance of volunteering is taking place at the GKHPS in Doddaholluru. 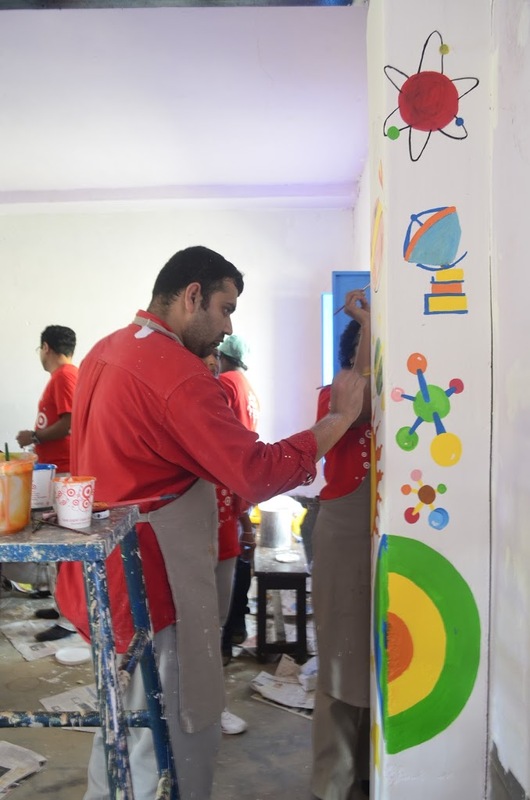 The thirty five Target India employees who are volunteering here are enablers, providers of opportunity that day, as they go about restoring to pristine condition an old, disused library in the school and a room for science. The school wears a discreetly festive air. There is a quiet hum of activity and purpose. Visitors are streaming in and Harshita and Manjula, Std. VII students, welcome them with a single red rose and a shy smile and fade tactfully away. Today it is the volunteers who are unwittingly centre stage as, with a hushed sense of mission, they take to completion their self-appointed task. The library used to be a picture of rundown depletion, sadly, for a school with no obvious infrastructure deficits. The volunteers are painting it and stocking it with books. The science room, once painted and invigorated, will accommodate the many projects the children undertake under the guidance of their tireless science teacher, Basavaraj, a live wire of a person. It will be a place for experimentation and discovery, for unravelling science, a subject that is one of the school’s singular strengths. This is example-setting volunteering. Guru, the Target volunteer in charge of reconnaissance, made three fact-finding trips to identify and assess the school’s requirements. The day’s endeavour is a targeted intervention to provide something the school needs and will, hopefully, make use of. Not random goodwill. An image make over is in progress in the large, light-permeated library. A preliminary coat of thinner has been applied, but the soiled walls show through the thin translucence, scooped out or peeling in places, which the volunteers have scraped and filled in even-handedly. A painterly landscape dominates, with brushes and big hammers, screw drivers and rollers, and large cans of thinner and synthetic enamel. Mugs half-filled with cloudy blue paint for the room’s many metal windows jostle in the assortment. All bought through volunteers’ contributions, including the elegant, red metal racks and the 2012 books that will go on them. The number 2012 is significant. It signals the year of the library’s resuscitation. 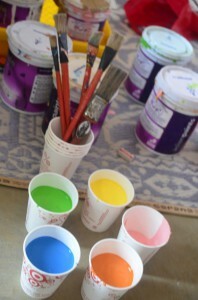 It is a thoroughly professional approach, not least the painting, though most of the volunteers are first-time painters. Like Stephen, with a protective bandana round his head, about to go up a step ladder to paint the upper reaches with an intuitive sense of the work at hand. Outside the library a section of the verandah has been unofficially cordoned off. There, on sprawling mats are the 2012 books meant for children up to Std. VII. 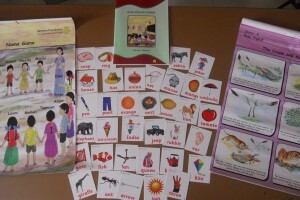 They are in Kannada and English primarily, and some in Hindi, straddling fourteen classifications – stories, comics, General Knowledge, science, computers….There are books that build skill-sets too, in grammar and essay writing, for instance. Every book is being labelled with a unique code that will ensure that they do not all end up in a disorderly mélange where nothing can be found. Thick, plastic-coated brown paper is being fitted on the racks and the books will be arranged on them. The library was a crumbling institution in school. When this ensemble comes together – the fresh newness of paint, the scenery charts, hand-painted inspirational quotes on education, the gleaming books on smart racks – it will symbolize renewal and create a space for children to read, learn and grow. In volunteering there is also the not-so-exalted department of the mundane – the logistics, the hot food, the cold drinks…… All the eminently forgettable nitty-gritty at times like this. Anantha volunteered magnanimously to organize and provide and clear up. “Too many challenges in that,” he says affably. “What to source, what to provide, at what time. I got beverages, but how would I keep them cold when the school has no refrigerator and there has been no power the whole day?” He worked his way ingeniously around that constraint. Anantha overlooked nothing – not the drinking water or water cups, the plastic spoons, paper plates or napkins, not the first aid kit. Then there is the humdrum everydayness of garbage, which needed some astute planning. Anantha will take ten bin bags with all the day’s debris back to Bangalore for disposal. At the far end of the rambling school building is the Science Block, announced in thick, black, declaratory lettering. 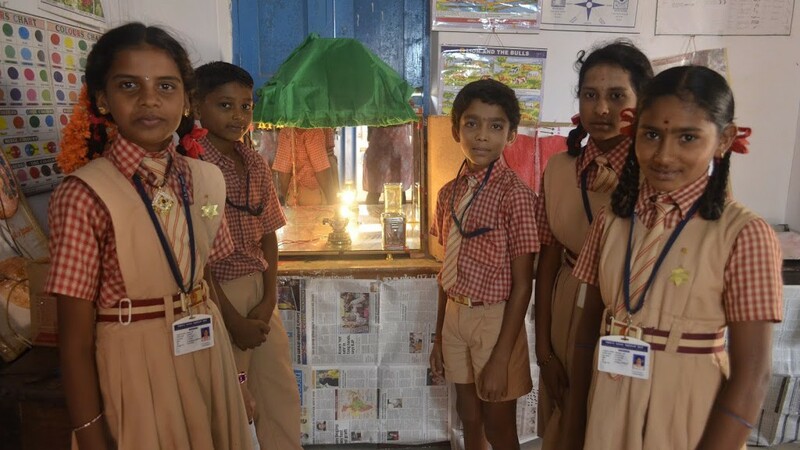 It underlines the scientific temper of the school, personified by the motivated Basavaraj who leads his students in curiosity-driven exploration. He teaches in Std. V, VI and VII. 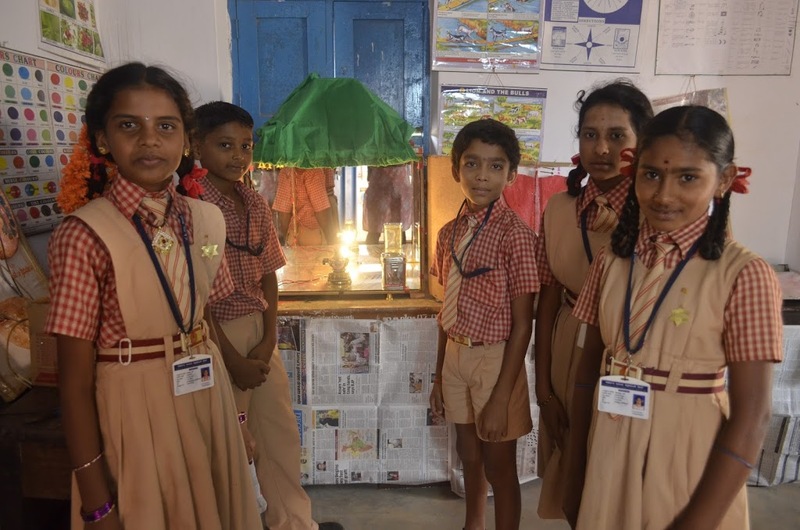 Propelled by Basavaraj, his students have creatively designed a water recycling plant, a mobile phone tower, a hydel power generating dam with smaller check dams along a river stream to harness water to the fullest. And many more items, besides. 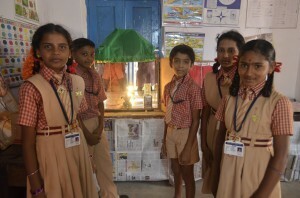 “I like science, “says Kantalakshmi, showing off the periscope she and her classmates have made. “It is used underwater during war. I learnt how the heart functions also.” Basavaraj was instrumental in spurring the children to make a simple instrument out of a plastic bottle, straws and a piece of fabric. “All low-cost material,” affirms Basavaraj. Kantalakshmi blows through the straws, then takes an inward breath and the pleated folds of the fabric in the bottle expand and contract, simulating the operations of the heart. Harshita too confirms that she likes science, her earlier reticence melting in a flood of words. “I like learning about the heart, about health and nutrition. We carried out an experiment in class that demonstrates the force of air and water. I observe things through the microscope,” she says in wonderment. The Target team is in an act of consecration in the science room, dressing it up, painting it. Samir, Anu and Noor also team up to embellish with their art the two pillars that jut out, hand-painting the universe, the earth, a space ship, a rocket taking off. Samir is in Development at Target. He has a speech and hearing impairment. This is his first experience of volunteering. “I am an artist,” he says, hands flying in communication. “I want to do art with children in schools.” A paint-flecked khaki smock over a long-sleeved, dull red shirt bespeaks a heightened awareness of colour. Samir is painting a half-sun on the edge of a pillar in the science room, a yellow semi-circle with dancing orange flames – half the world in light.